Happy Father’s Day to Nick Cave! Happy Father’s Day to Nick Cave & The Bad Seeds, and to all the ‘Dads’ out there who count themselves as fans. Keep on rocking, chaps! Enjoy your Sunday! Much love and gratitude! — Susie Bick, on her husband, Nick Cave, who is father to 7-year-old twins boys, Arthur and Earl, and to 16-year-old Luke and Jethro (at left, with their famous Dad). For Nick Himself, an interview with Johnny Cash’s only son: Lessons from My Father: The Man in Black, by John Carter Cash. Enjoy, Father Cave. This entry was posted in Uncategorized by Morgan Wolfe. Bookmark the permalink. Luke Cave is also very tall like his dad. Jethro Cave is a very beautiful girl…. 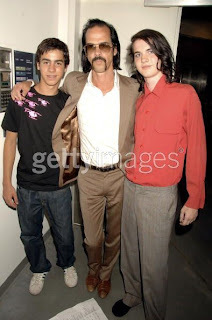 Jethro Cave looks a lot like her dad. Jethro Cave is a very beautiful girl. She is 6’2″ in her bare feet. She should grow her hair waist length and bleach it pale blonde. If Jethro Cave would look much better if she bleached her hair pale blonde and wore haute couture dresses. Ha! What a cool anecdote! With a name like Jethro, it’s kind of satisfying that he’s got the more devil-may-care attitude of the two. Thanks for that extra tidbit. You’re definitely a good source for Nick Cave details! Isn’t it a wonderful photo? I’ve seen other pictures of Jethro and he’s got Nick’s tall, lanky frame and that heavy-browed scowl. Lots of resemblance there. The domestic situation has improved for all concerned since the boys were born. They’re only 10 days apart, which must have been hard on Luke’s mother, Viv, who was married to Nick at the time. Jethro is, in fact, Cave’s firstborn son. But why dredge it all up? Nick has said he will ‘eternally regret’ not being part of Jethro’s early years but that he’s proud to be in his Australian son’s life now. They get along fine. I forgot where I read it, but there was an amusing anecdote published about Nick sitting between Luke and Jethro in the back of a taxi when they started talking about whether they believed in God. Nick and Luke agreed that they did, Luke adding, “My whole family believes.” Jethro said he didn’t believe and that remark just hung in the air until, supposedly, Jethro smirked and called them “Goddies.” He’s got his dad’s wit! Wow! I haven’t seen a picture of him and his two older sons together yet. This is such a wonderful photo. Makes you wonder how family life is, but it’s also cool to think he’s got a 16 yr old Australian son and a 16 yr old Brazilian son. You just can’t help but compare their two styles and imagine how they’ll grow up when separated by continents, yet linked to the same famous father.